This bold new play by one of Ireland's leading writers hits on a question that has become increasingly urgent; should women be allowed to be priests? An unconventional nun becomes involved in a group advocating for the ordination of women, and drags her fellow nuns reluctantly into the movement. Meanwhile, a dying Bishop regrets not doing more to reform the Church. Are the stars aligning? Provocative and funny, Biddy Jenkinson‘s new play is not to be missed. Oirniú ban is ea príomhthéama dhráma nua Biddy Jenkinson, ceist atá éirithe iontach tráthúil le tamall anuas. Cuirimid aithne ar bhean rialta atá ag agóidíocht ar son oirniú ban, agus ar Easpag atá ar leaba a bháis agus ar mian leis athrú mór suntasach a chur i bhfeidhm roimh bhás dó. An bhféadfadh go ndéanfaí oirniú ar bhean rialta? Ná caill an dráma nua, dána, dúshlánach seo. 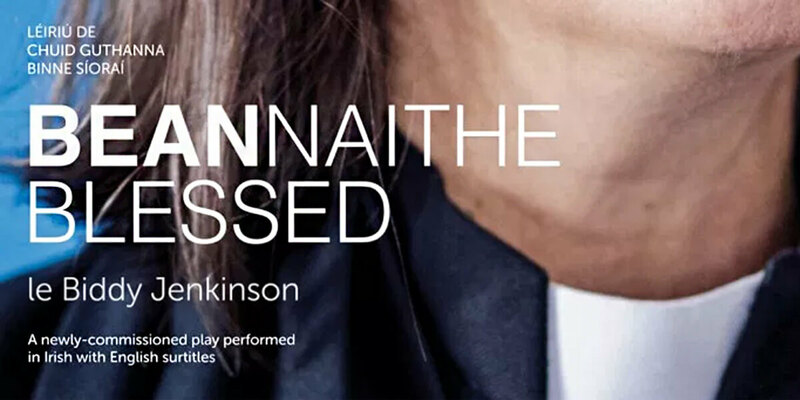 ‘Beannaithe‘ / ‘Blessed‘, is a new Irish-language play performed in Irish with English subtitles. Cast: Dairíne Ní Dhonnchú, Áine Ní Mhuirí, Bríd Ní Ghruagáin, Cathal Quinn, Cillian O'Dee.